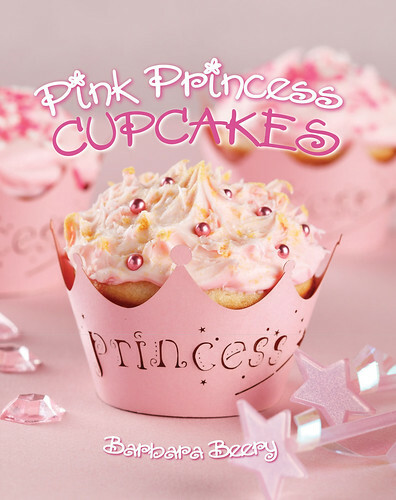 Yes, it's another contest, this time to win one of five copies of cookbook author Barbara Beery's latest, Pink Princess Cupcakes. To enter, leave a comment on this post with your email address telling us why you want to win it! Entries limited to U.S. and Canadian addresses. Winners will be chosen randomly. Deadline: February 15, 5 pm EST. Please note: We moderate ALL comments so please only leave your comment once. Barbara Beery's official site is Kids Cooking Shop and her latest video is below, on making Valentine's Day cupcakes. Click here for the recipe. I think I should win because my son Kai said 'I was the best mommy in the world and that I deserve it because I clean the house.' I hugged him . It would be a fun way to make Cupcakes with Him and My step Daughter! ooohhh pink! ooohh princess! I completely need this! i don't know what could make anyone deserving of such a precious cookbook lol. i'd love it because my life has been completely void of anything girly and cute lately and this would spark a new chapter! I have a princess, Annabelle my granddaughter, that will be 5 on March 24th. She loves Everything Princess! I need to win this cookbooks as I have 3 young daughters....lots of princess in this house! I think I should win b/c I one child and he is a boy . This book I would share with y little niece and we would have a great time! I would love to win this cookbook. My six year old daughter is my Pinkalicious Princess and has her very own collection of cookbooks. Pink Princess Cupcakes would be a perfect addition to her library! I would love to win this to whip up some cupcakes with my two little princesses. Faith is six and Brianna is two. They are my kitchen helpers! I would love to win the Pink Princess Cupcakes book! I really don't have a better reason than the ones I've read...but I do think it's precious and would love to learn her tricks! I am the complete and total princess. I bake cupcakes almost every day for friends, family, work and anyone else for that matter that wants one cause that's what a princess would do! I would be thrilled to have this book. A princess book for a true princess! I am always making cupcakes for customers and my daughter isn't allowed to help me with those. I would love to have this book so that my daughter and I could have some special cupcakes to make with one another.! I would love this cookbook because I am a kid at heart and love anything pink and princessy, especially when there are cupcakes involved! I think I should win this because I LOVE baking cupcakes...especially for my little princess who is turning 7 this month. I have no cookbooks on cupcakes and this one would be FABULOUS!!!! I love baking & learning new baking techniques! I hope we WIN!!! I would love to win this cupcake to whip up some pretty pretty princess cupcakes. I would love to win this book! I am a cupcake fanatic and have turned my 2 girls in cupcake fanatics...and thankfully, because otherwise my husband and I would have alot of cupcakes to eat!! I love making cute cupcakes - the cuteness is half the fun!! I have one of her cookbooks and would love to have this one. I collect Tea Party books and Baking books so this is a great combination. My daughter asked if I would give it to her if I won. How cute! I would love to have this book! I'm new to the cupcaking world and am uber enthused about it! I've been baking like a mad woman since I had a baby and quit my job and my newest hobby is cupcakes!!! Please pick me, I will make good use of the book! I'd love to win so I could make those cute cupcakes for my little cousins! I would like to win simply because I think it would be fun to ready. I would love to win it and give it to my niece who is a princess and give it to her as her first cookbook so she can start learning early. I would love this book because I have a little girly girl who would love it. We'd love to win this book! This book looks adorable! I would love to win to learn all her secrets. What a wonderful world to enter into! The cupcakes, scones and Unicorn Horns are sound so magical and delicious! The Fairy Berry Tea would be fun to make and then have a tea party. I have a niece and great-niece who would enjoy every aspect of this wonderful Pink Princess Cupcakes Book. I should win because I can make some cute cupcakes with them and post them on my blog! I want to win this cupcake cookbook because my daughter's 6th birthday is coming up and the theme is going to be PINKALICIOUS! Pinkalicious is my daughter's favorite book, which depict a little girl dressed in a pink princess costume eating too many pink cupcakes. I would love for this cook book to be the first present she opens. She would love it, as she loves to help bake as she does read. Thanks so much for the opportunity to enter my name. I teach a girl's cupcake class and this would give us great new projects! There is also a Princess living in our house! Pick me please! I have two little princesses of my own and their birthdays are coming up soon. This cookbook would be a great way to cook with my 5 year old twin nieces, the ultimate princesses! What a fun book! My daughter wants a princess party this year, so this book would be great! As the mother of three girls who love all things pink and princessy, this cookbook would be awesome to have! I would put that cookbook to work! Having just recently graduated a semester early (insert celebration here! ), I'm stuck home alone all day while my friends and roommates are in class. I would love to try out the recipes in this book and whip up a delicious storm each day for when my roommates return home from a long day of studying! This is great - as my Mom says, we do girls in our family! My daughter is the princess of pink, and so are her four cousins, and my cousins three daughters. The book would be so much fun to share with all of the princess generations of our family, as wel as all of our princess friends! And, I am the official baker of the family, so the book will definitely go to excellent use! ...cuz I AM a pink princess cupcake!! I'd love to win this book so I'd have lots of Princess cupcake recipes to make for my little granddaughter, Phaedra! After years of waiting, I finally have a GIRL to make frilly things for!!! I'd like to give this book to my niece, Lillian. She loves to bake with her Nana and she is a true girly girl. I'm in NC and she's all the way in CA--it'd make a great care package to send the book with some sprinkles, etc. Since there are just boys in my house I need to find ways to stay girlie and this book will help! My stepdaughter and I have been baking in the kitchen constantly. I guess you could say I do the things with her I wish my mom would have done with me and she wishes her mom would do with her. I LOVE baking and even talked to my husband about opening a bakery. I don't think I deserve to win more than anyone else but just seeing the cover made me feel pretty. And I'd love to make some of those recipes for other people to give them that feeling of being pretty and special too. I'd love to win so that I have a good foundational cupcake book. I'm done with internet searching for every cupcake recipe I make. I would love to win this book! I love princesses! I'm just getting into the baking and decorating world of cupcakes and cakes. Our dorm survives on the cupcakes my friend Sarah and I make throughout the semester. Last Fall we used Barbara Beery's Pink Princess Tea Party cookbook during exams and everyone loved what we made! The Pink Princess Cupcake Cookbook would be a great addition to our cookbook collection and would make a lot of hungry Tulane students very happy! I think I should win because my little princess is turning 2 this Saturday and when we drove up to that cake supply store today she said, "THE CAKE STORE MAMA!!!!!" love it! love it! love it! pink, princess, cupcakes, cookbook = 3 very happy nieces and 1 proud aunt! I would love to make things from here with my nieces and young cousins. Looks great! I would love to win because are all Woman are Princesses inside....and what princess doesnt like to cook cupcakes? What girl doesn't love princess themed cupcakes?! I would love to win a copy of this book! This would be a great book to add to my cupcake book collection. Thanks for the giveaway! I want to win this because I would like to bake cupcakes with my little niece. She loves cupcakes as much as I do and she thinks she's a princess. So this book is perfect for the two of us! I would love to win this cookbook so I could learn to bake things that are not only yummy, but pretty! My email address isAudrey313@aol.com. Would love to win this book! This would be perfect for my bustling kitchen of four daughters! I would love to win - the youngest in my family got the "Mermaid Cookbook" by the same author and we had a blast making some mermaid treats. I'd love to win this book. I host princess tea parties and this would take them over the top. With 4 little princesses in my castle, this would be a wonderful, fun book to enjoy with them. They love everything fancy, including fancy treats! My daughter absolutely loves pink and princess! Her birthday is coming up and I was looking around for a recipe for a pink princess cupcake and voila! Thank you for the post, love the pictures. I'm making one of them for her birthday. I'd like to really have the cookbook for future parties or even just for anyday treats.